The UN has brought rack and ruin to the United States in every area of American Life. The same has been true for every area of world conflict. And all of its creators forever. The exact same fate should befall “the current UN” because since its creation, The United Nations, has repeatedly failed in its duties consistently; ever since it was forced upon the peoples of the world. 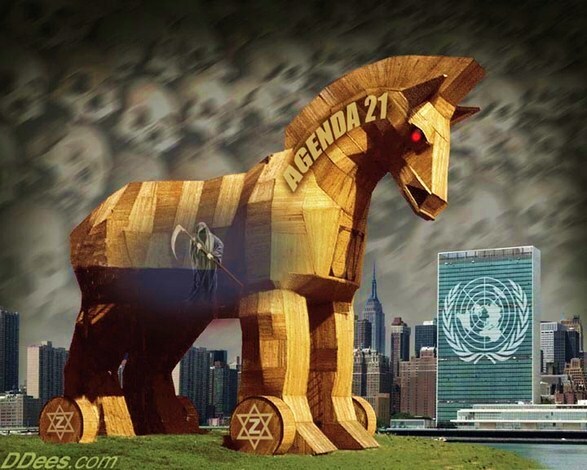 Everywhere the UN has gone, massive criminal activity has increased: Sexual slavery, the selling of body-parts, increases in the marketing of guns, drugs, and in all types of crime, not to mention global-trafficking in antiquities. Everywhere the blue-helmets go, chaos always follows: The introduction of the UN anywhere has always spelled disaster for the people in any nation that has allowed these tyrants to enter, because the UN spells death for the people they are supposedly invited-in to protect. The last thing that any nation needs now is to involve the UN in the 5 year long global attack on Syria. “A New World Order”. Wilson's suggested method to introduce the NWO to the world was to be his “League of Nations”. Nothing works because we've allowed them to take control over every facet of our lives, and just like ants we scurry about trying to stay out of the path of the globally directed sickle's that descend upon the human race each and every day. Dissolving the United Nations seems like a great place to start. In reality we have the power to evict the UN from the U.S. So WHY have we done none of those things?